NEW YORK -- Dozens of people got into a chair-flinging, glass-shattering midnight melee at a racetrack casino when patrons clashed at a daiquiri bar opening, police said Saturday. The brawl unfolded in front of hundreds of people late Friday in a food court at the Aqueduct track's Resorts World Casino, where the Fat Tuesday chain's first New York location was opening. By the end, three people were arrested or ticketed on disorderly conduct charges, a police officer suffered a hand injury and at least two other people also were hurt, authorities said. Firefighters say at least two people were taken to hospitals with minor injuries. "It was chairs flying everywhere - it was chaotic," witness Elize Brown told CBS New York station WCBS-TV. She said the mayhem erupted amid long lines and crowds at the bar. "It was nerve-wracking. It was like you don't know what the next thing that was going to happen was." Officers arrived just before midnight to find about two dozen people fighting, police said. 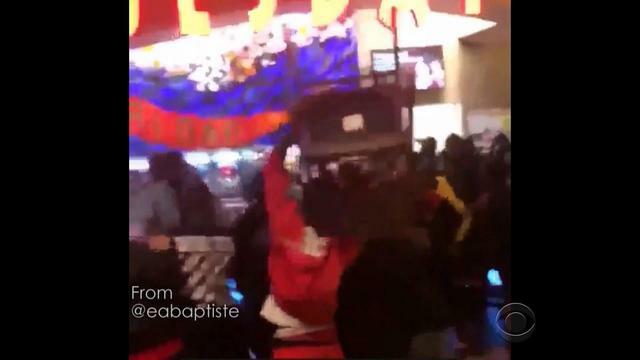 Some of the hundreds of onlookers posted video showing people punching each other, tossing chairs and brandishing rope-line stanchions next to the newly opened Fat Tuesday. Security guards try to quell the brawl, and one of them takes a slap to the back of the neck, as people grapple and climb over railings. The casino operator said Saturday it was increasing security and working with police to examine what happened and prevent a repeat. "There is absolutely no room for this kind of behavior at our facility," Resorts World said in a statement. New Orleans-based Fat Tuesday referred an inquiry about the events to Resorts World. Built just three years ago, the casino has become the most successful racetrack casino in the world, attracting about 12 million people a year to its electronic gambling. There are no poker or blackjack tables.